Who wants to go to Cuba? Who wants to find out about volunteering in Cuba? Who wants to volunteer on a farm? Wait! Hear me out! I know what you’re thinking…I’m in Cuba and you’re asking me if I want to volunteer on a farm? Are you serious?! I’m absolutely, 100 percent serious! As I embarked on my search for volunteering in Cuba, I hit a wall. 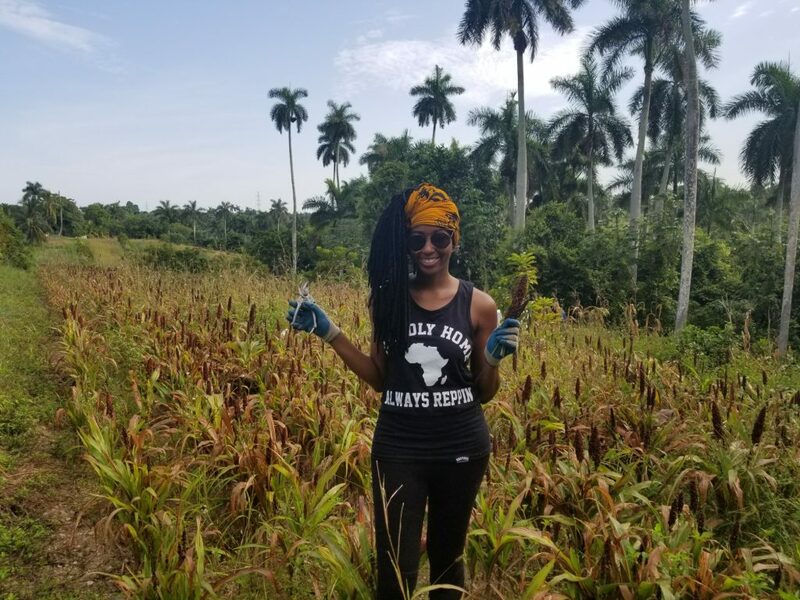 There wasn’t a whole lot of information out there about volunteering in Cuba and what I did find was mostly through tour companies who didn’t offer up information on volunteering without booking a trip through them. I didn’t think I would ever find anything, but then the clouds parted, and the sun shined and there it was on the glorious world wide web, in all its agricultural glory. Finca Tungasuk! 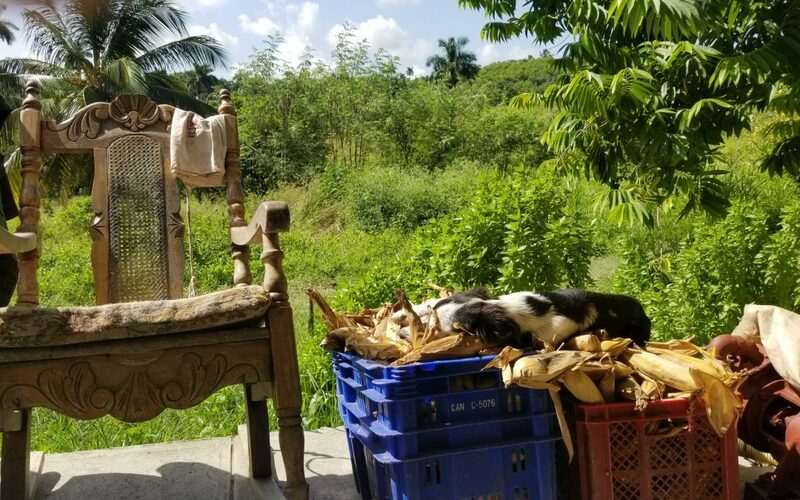 This organic farm is tucked away in the beautiful, lush tropical countryside of Cuba, just a short ride outside of Havana in Caimito and run by Annabelle, Alfredo, and Oscar. Give them time to respond as the internet access they have is limited and they only check their messages once a day at the most. Your day will start at 8 a.m. and end after lunch around 1 p.m. Annabelle is the sweetest woman I’ve ever met. Seriously, how can a person be so wonderfully, sweet and kind?! She’s also an amazing cook! Fun fact: Annabelle used to be a chef in France. This family is well traveled and just an all around joy to be around. Annabelle will arrange a ride for you from Havana to the farm for up to four people for 30 CUC. Lunch at the farm is 15 CUC and if you ask me, you don’t want to miss lunch. It was definitely a highlight of the day. My friend AJ and I enjoyed our time at the farm, especially lunch! When you arrive, there is no sign. The dirt road is hidden amongst the vegetation and palm trees lining the main road. When the taxi veered off the road, we slowly crept our way further into the tropical forest and I was like….where the heck is he taking us!??? I thought we were going to a farm? We were dropped off outside of a fence that was laid down in the road and walked the rest of the way to meet Annabelle. As AJ and I followed her to the farm, the trees opened up into the most beautiful view of fields and a quaint house on a rolling hill. They have quite a few dogs, so keep that in mind if you’re not really an animal person. 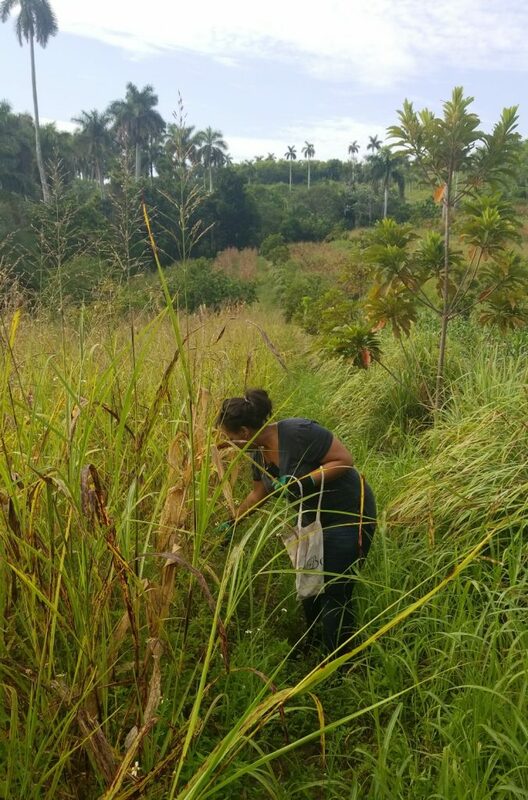 Once we reached the house, we were given an introduction to the farm and why they started the volunteer program. There are efforts being made to get Cubans to start cultivating the land and growing their own crops to help sustain their own economy. 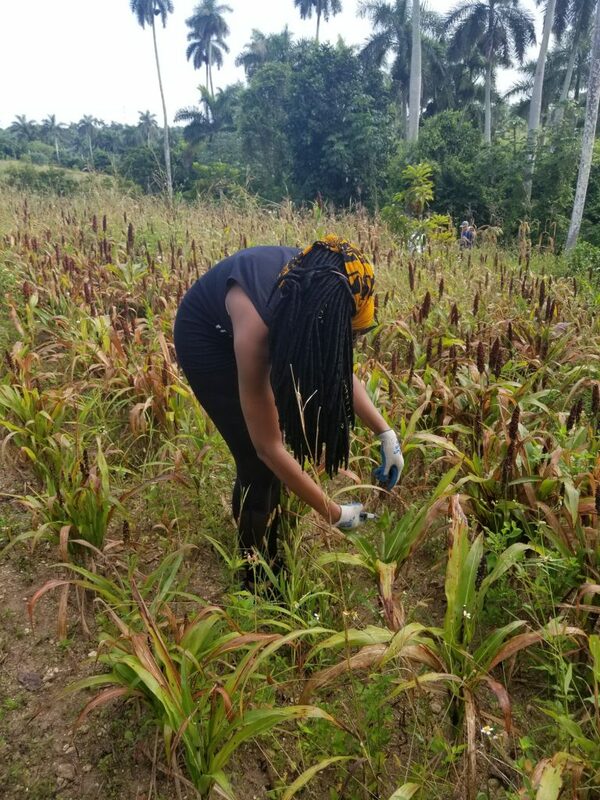 They’ve had some struggles getting younger people to jump on board so the volunteer program helps them keep up with their farming. Once we were given the lay of the land, we picked out gardening gloves and got to work. I cannot for the life of me remember what we were cutting, but it was red and reminded me of quinoa. They use it to make flour perhaps of the gluten free kind if I’m remembering correctly. I setup my camera to record in one of the trees and got in the fields with AJ. It was super humid, like being Houston when you step outside and you’re instantly drenched, but ten times over. I was sweating something serious, but the view was everything. Now, let me just say, if I had to do it all over again, I would still volunteer at Finca Tungasuk, BUT I cannot finish this story without telling you about the ants from HELL. If you read my post about the top 7 things to know about Cuba, you know I mentioned these tiny, evil red ants. Alfredo told me they were called fire ants, but these aren’t like fire ants back at home. My run in with the ants happened on a warm Cuban day on the outskirts of…lol but it WAS a warm day though. Anyway, they don’t bite you. No, they’re more sinister than that. They just spray some type of acid that burns the hell out of you. They just walk across your skin…all leisurely like, without a care in the world, excreting this substance. It’s like someone lit a match! When I felt the first sting of a burn, I didn’t think anything of it, but then it was more incessant. Then came the pulsating burning. It was ridiculous! We were out in the field when it happened. Oscar was coming around to bring us another bag when he saw me hopping around like a chicken with its head cut off. He told me to go back to the house and have them give me ice. I distinctly remember AJ telling me thanks for taking one for the team because she was ready for a break anyway. Friends. How many of us have them? Annabelle and Alfredo gave me an ice pack and then some spray and let me tell you. The relief was almost instant. I slumped from the relief. Woo, ya’ll this pain! It is not the business, at all. When I was no longer burning from the pits of tiny ant hell, we resumed working until we filled our bags. Back at the house, we shucked the corn and Oscar and another volunteer cut down a huge bunch of bananas with a machete. After we were done with the corn, we were each handed a coconut to drink. Let’s play “never have I ever.” Never have I ever gotten full from drinking coconut milk, until now. There was so much in the coconut. I thought I was never going to get to the bottom! I mean, I didn’t, but I’m just saying. It seemed like an abyss! 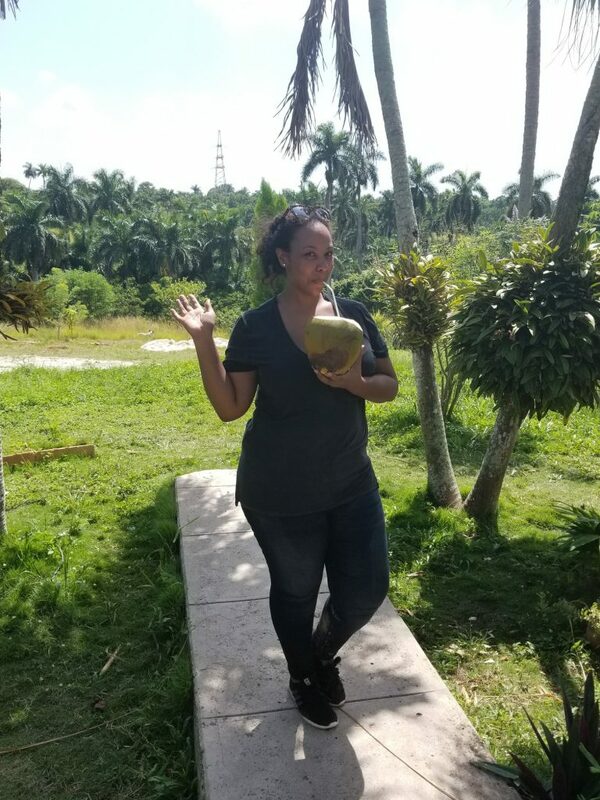 There’s just something amazingly delicious about drinking straight from a coconut that was cut directly from a tree. 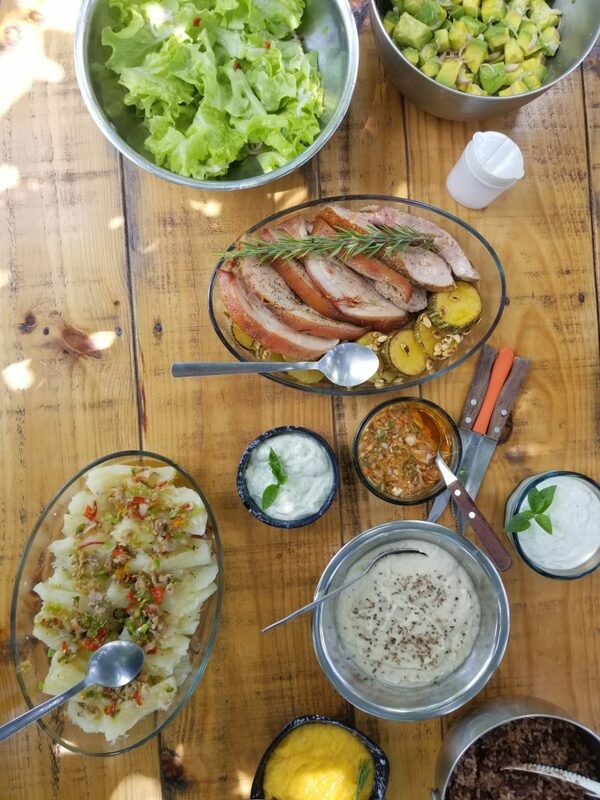 Soon after, we were setting the table with all the deliciousness that Annabelle had been making while we were in the fields. This woman’s hands are blessed by Jehovah Jireh himself. The couple that were volunteering with us said they hadn’t really had great food since they’d been in Cuba until having Annabelle’s meal. I would have taken a plate or two back to our casa particular if I could. And just like that, our farming experience was over and we were headed back to Havana, leaving the tropical oasis behind us. Have you volunteered in Cuba or are you interested in volunteering on the island? Tell me all about it in the comments! When you flew home, did you tell CBP/immigration you visited a farm? Did they pull you aside for additional inspection? Great question! No, we didn’t get pulled aside for additional inspection because we weren’t around any livestock or animals. They only grow produce, so it isn’t an issue.